The Vue Apartments is an anticipated project within the Bay View neighborhood. This new multi-family housing development adds 69 residential units, as well as 2,500 sf of primary commercial tenant space, and provide two levels of covered parking for residents. 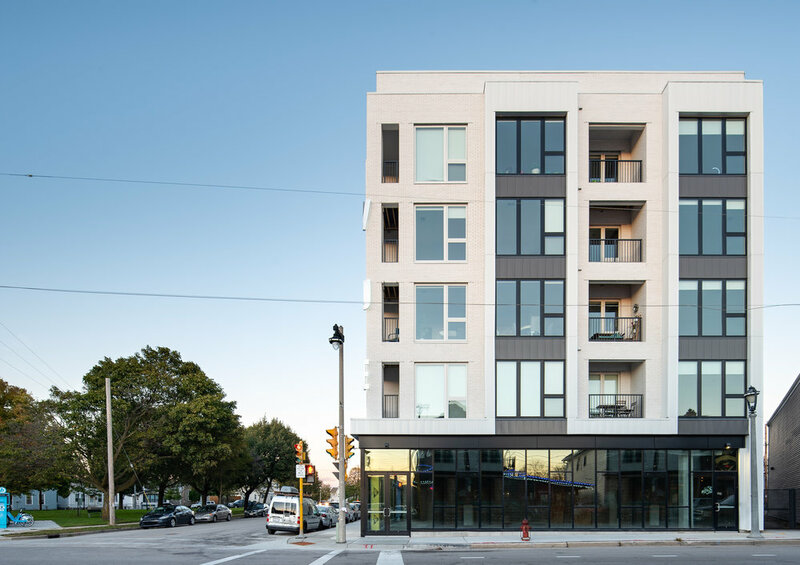 Situated on heavily trafficked Kinnickinnic Avenue at the north end of Bay View’s burgeoning business corridor, the site for this new building presents a unique set of conditions which begins to inform the building design. Referencing Bay View’s roots, the design of this new development is consistent in possessing an updated and refined take on the scale and aesthetic of the neighborhood. The facade is constructed of brick masonry, metal panels, and a high performance glazing system to create an elegant, clean , and well detailed enclosure system. Glazed openings were maximized across the all facades to wash the modern interiors with light. Taking cues from existing datums, patterns, materials, and rhythms, the building has been shaped and articulated in response to its context. The 5-story volume has been broken apart and striated vertically between to reinforce and continue the predominant scale and rhythm of the surrounding buildings. The first floor level offers 2,500 sf of highly visible prime commercial tenant space, extending business development opportunities to the northern boundary of the Kinnickinnic corridor.